Pamper your skin with this rich nourishing moisturising lotion, enriched with Aloe gel and a blend of Almond and Sunflower oils, it protects and Moisturizing your skin deeper, leaving it wonderfully supple and soft. Butylated hydroxy Anisole, Butylated hydroxy Toluene, sodium methylparaben and sodium propyl paraben. The lotion comes in a sturdy plastic bottle which is in light yellow colour with a pump dispenser and a white cover lid. It is travel and user friendly. It is a milky white lotion and it is neither runny nor creamy. The texture is pretty good and it smells mild with a flower fragrance. The summer already said goodbye and the monsoon has arrived. Though my face skin is not changed much my body skin became dry because of dry weather. 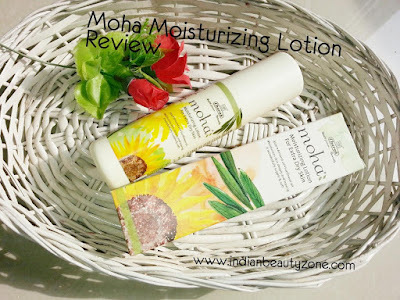 I am using this Moha body lotion regularly and really liked it a lot. The texture is so light and easily gets absorbed by the skin well. I am applying it for my body skin after bath to keep my skin hydrated. This lotion really helps me to retain the moisture of my skin for long time. It gives hydration and nourishment to the skin well. My skin tone improved by using it regularly, I know it is because of the almond oil and olive oil present in it. The pump dispenser is reallly helpful to take out the desired amount of lotion. 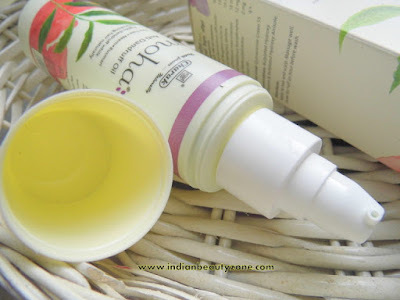 It has very mild flower fragrance which feels good after applying it. I use it only one time a day because I feel the moisture it gave to the skin is enough for me. 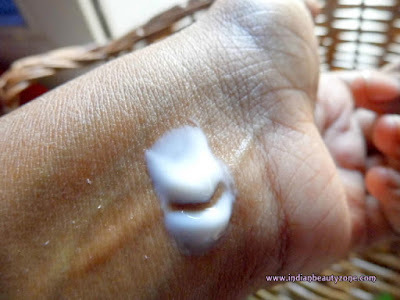 Overall it is a decent lotion which can be applied for face too those who have very dry skin. It is not feeling greasy on the skin. Herbal brand that don't hurt any animals for testing. International quality herbal cosmetics at very low cost. Moha Moisturizing Lotion is a good lotion which can be used as body and face lotion those who has dry skin, I am sure you will like it. A range of herbal skin care products, enriched with rich cocentration of natural, skin friendly herbal actives. Moha herbal cosmetics are the ultimate solution to your beauty problems.